Notes As of June 30, 2013 Bank of Jackson County had approximately $25.5 million in total assets and $25.0 million in total deposits. In addition to assuming all of the deposits of Bank of Jackson County, First Federal Bank of Florida agreed to purchase approximately $23.1 million of the failed bank?s assets. The FDIC will retain the remaining assets for later disposition. Notes As of June 30, 2013, First National Bank had approximately $3.1 billion in total assets and $2.3 billion in total deposits. In addition to assuming all of the deposits of First National Bank, PlainsCapital Bank agreed to purchase approximately $2.7 billion of First National Bank's assets. The FDIC will retain the remaining assets for later disposition. Notes As of June 30, 2013, The Community's Bank had approximately $26.3 million in total assets and $25.7 million in total deposits. The amount of uninsured deposits will be determined once the FDIC obtains additional information from those customers. Notes As of June 30, 2013, Sunrise Bank of Arizona had approximately $202.2 million in total assets and $196.9 million in total deposits. In addition to assuming all of the deposits of the failed bank, First Fidelity Bank, National Association agreed to purchase essentially all of the assets. Notes As of June 30, 2013, Community South Bank had approximately $386.9 million in total assets and $377.7 million in total deposits. In addition to assuming all of the deposits of the failed bank, CB&S Bank, Inc. agreed to purchase approximately $121.7 million of the failed bank?s assets. The FDIC will retain the remaining assets for later disposition. Notes As of June 30, 2013, Bank of Wausau had approximately $43.6 million in total assets and $40.7 million in total deposits. In addition to assuming all of the deposits of the failed bank, Nicolet National Bank agreed to purchase approximately $29.9 million of the failed bank's assets. The FDIC will retain the remaining assets for later disposition. Notes As of March 31, 2013, First Community Bank of Southwest Florida had approximately $265.7 million in total assets and $254.2 million in total deposits. Notes As of March 31, 2013, Mountain National Bank had approximately $437.3 million in total assets and $373.4 million in total deposits. 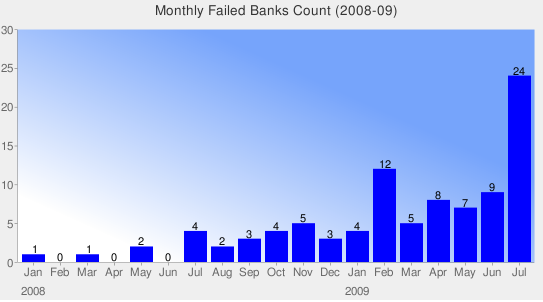 In addition to assuming all of the deposits of the failed bank, First Tennessee Bank, National Association agreed to purchase essentially all of the failed bank's assets. Notes As of March 31, 2013, 1st Commerce Bank had approximately $20.2 million in total assets and $19.6 million in total deposits. In addition to assuming all of the deposits of the failed bank, Plaza Bank agreed to purchase essentially all of the failed bank's assets. Notes As of March 31, 2013, Banks of Wisconsin had approximately $134.0 million in total assets and $127.6 million in total deposits. In addition to assuming all of the deposits of the failed bank, North Shore Bank, FSB agreed to purchase approximately $97.4 million of the failed bank's assets. The FDIC will retain the remaining assets for later disposition.